Is Germany truly green or not? This article is to explain the current situation of Germany’s Energiewende. Since 2013, the proportion of coal in the production of electricity has been continually falling in Germany (graph 1). As compared to 2003, the annual electricity production by coal has dropped 45TWh (14.8%), while annual electricity production by nuclear also dropped 80TWh(48.5%). Even compared with the statistic of pre-Fukushima 2010, electricity production by coal still reduced 3TWh in 2016. This February, a new 1100MW coal power plant became operational in Germany(goo.gl/rmwZ4M), which some believe to be the last coal power plant the Germans would ever be able to build. On the other hand, two coal power plants were decommissioned in April, with a total capacity of 2234MW. As one goes online, two went offline; Germany is still on track of reducing its reliance on coal. However, there does exist menace on whether such trend can endure. The new right-lingered CDU/FDP coalition elected in the coal state of NRW calls for a deceleration of coal phase-out and renewable developments planned by the previous SDP/Greens government. If the Bundestag election in mid September turns out to favor also a CDU/FDP coalition, the threatening policy might become nationwide. In the energy politics of 2016, news of the revision of the renewable energy act (Erneuerbare Energie Gesetz) is definitely on the spotlight. Beginning in 2017, all large scale renewable projects will no longer be in the feed-in-tariff system; instead, a cap-and-auction method is now implemented, where companies bid for the lowest subsidy demand gets the license. The policy is usually considered as a way to inhibit “over expansion” of renewables by the CDU. Auctions tend to have problems on the completion ratio, and they also favor large enterprises. Accidentally, in an on-shore wind farm auction, 93% of the bid was won by citizen led projects(goo.gl/sKadNm), although we cannot tell if this will become normal, and if these projects can be carried out in the future as scheduled. The main advantage of cap-and-auction is that it reduces the cost, which is why FDP greatly supports this policy. The auction on off-shore wind farm, resulting in zero governmental subsidy, seemed to have proven this claim. However, some claim that, due to improvement of technology, the previous FIT system could have had similar reduction on cost anyway; what is more important is that auction might inhibit the development of renewables too much, such that the growth rate of renewable capacity fall well below government’s target in the future. As mentioned previously, after the NRW state election, Germany’s road to Energiewende is cast with shadows. Whether coal power plants can be decommissioned is one question, the development of renewables is another. With Germany very much likely to miss its climate target in 2020, the policy and aptitude Merkel and her party take can hardly let us call her the “climate chancellor”. As renewables gradually develop and coal on the fall, since 2013 the energy sector of Germany managed to reduce its carbon emission even with a gradual nuclear phase-out(graph two); compared with pre-Fukushima 2010, the energy sector still managed to reduce 24 million tonnes of CO2 eq (6.7%). Compares with 1990, the reduction reached 95 million tonnes of CO2 eq (22.2%). However, this is still well below the target of 40% total emission reduction in 2020 the government set. As compared with 2015, total annual carbon emission rised 4 million CO2 eq in Germany in 2016. The slight rise was mainly due to the long trend of emission increase in transport sector, and also the colder winter which resulted in greater demand of residence heating. The increasing trend in transport sector can be found throughout all Europe, and remains the greatest challenge for a deep low carbon transition for the continent. For more details, one can refer to the following link: goo.gl/8sD6wf. Germany has been a net exporter of electricity since 2003. More importantly, Germany usually exports more electricity at noon, when the load demand is also the most; Germany also exports more electricity in the winter than in the summer, when the demand is also the greatest in the year. That said, Energiewende does not cause electricity shortage, in the contrast the inflexibility of conventional power sources makes Germany export electricity to other countries more. One can refer to our first article of this series for a more detailed explanation(goo.gl/oxxq8V). Two ways can prove the arguments above. As shown in graph 3, the peak of solar power production in summer, which coincides with peak load, also coincides with greater electricity export. Graph 4 shows that Germany exports more electricity during peak demand in winter. The proportion of renewables in electricity production in winter is usually above 30%(graph five), so the share of conventional power sources domestically does not increase too much. For example, the conventional power sources produced 7TWh more electricity in January than in June in the year of 2016, but the difference is mainly due to electricity export(Jan has 5TWh more export). What worths mentioning is that during January 2017, due to meteorology factors the share of renewables dropped significantly in Germany (to only about 27%). In that month, Germany not only exported less electricity than the previous January, it also has to increase the power production from conventional sources substantially to meet its domestic demands. But such scenario is rare, and if we view things in a greater time scale, solar and wind has been performing extraordinary since March, so the annual renewable share of electricity in Germany will probably increase this year. As we have been mentioning from the first article, the variability of renewables should not be over-emphasized in the mid-term target of Energiewende, what is more important is how to boost the share of renewables via dispatch measures and increase of capacity. Another common question in Taiwan is that whether France supports Energiewende by giving its nuclear power to Germany during peak load. 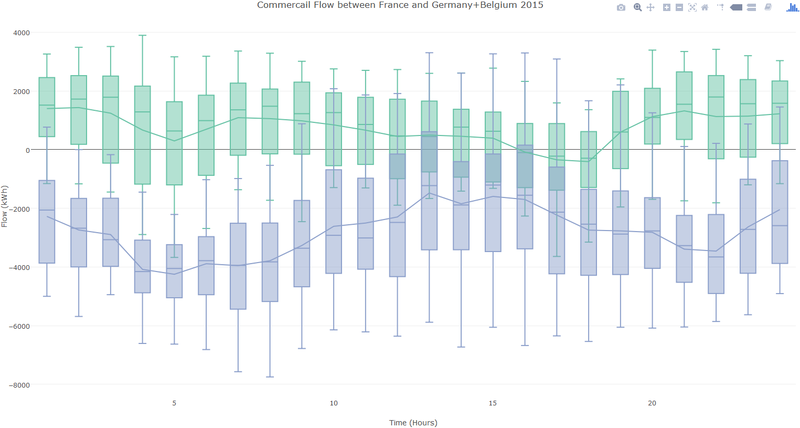 To answer this question we examine the commercial flow between France and Germany/Belgium. The reason why we should use commercial flow but not physical flow when examining this issue is because physical flow data only tells whether the electricity passed through the border; it does not tell you the real situation of market exchange (or else, the Panama canal must be the most economically prosperous place in the world). 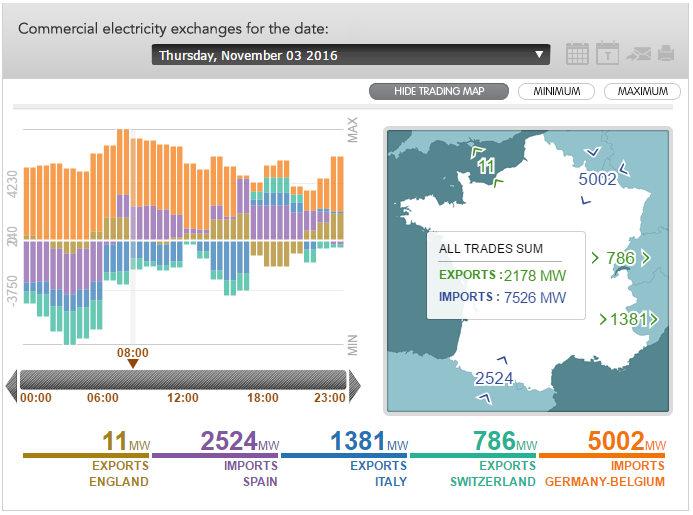 In reality, France and Germany recently has a commercial flow as graph 6 shows; France imports electricity from Germany in the afternoon, when demand is highest in both countries. As mentioned previously, renewables in Germany have been performing perfectly since March, especially this particularly month (June, see graph seven). 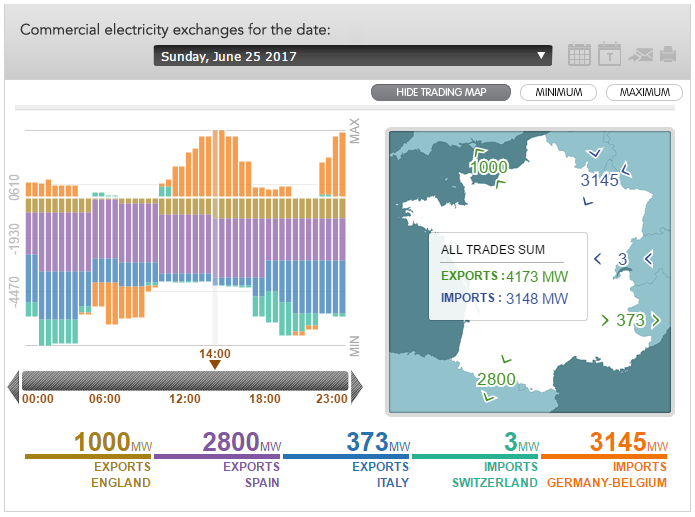 The abundant solar radiation in Germany results in an increase of electricity export to neighboring countries, including France. Overall, like any other country, France imports more electricity from Germany in winter, when demand load is greater; however, France has net export to Germany in summer, when demand load is lower (graph 8,9,10 and 11). 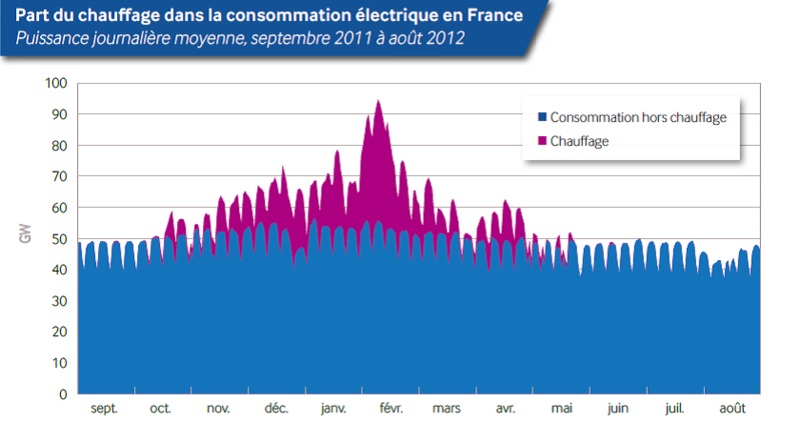 The reason behind this is that France has a maximum nuclear capacity of about 63GW, if you consider reactive power balancing the fleet generally won’t be supply more than 60GW, and thus France can only export more electricity in summer, when its domestic electricity demand is lower(graph 12). 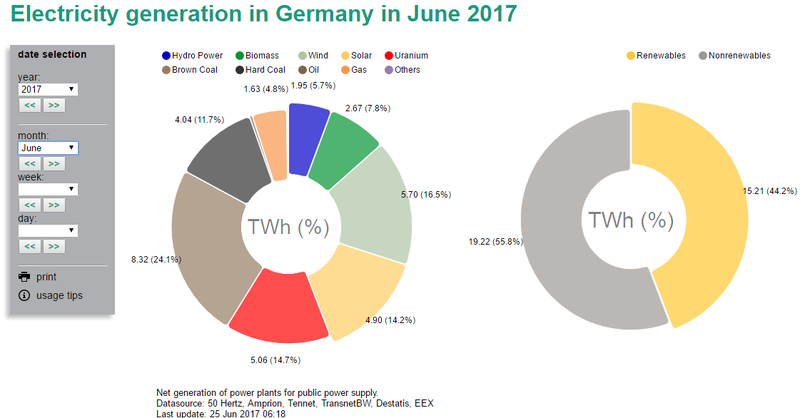 But summer is also the season when Germany’s renewables perform the best, conventionals produce the least and yet it remains a net electricity exporter. Therefore, it is hard to make a claim that French nuclear power supports Energiewende in Germany. By the way, as Germany will likely have to continually face the problem of relying more on fossil fuels in winter during their Energiewende, France will have to face power supply instabilities due to security issues of its nuclear plants. From last autumn to this January, ⅓ of France’s nuclear fleet were shut down because of safety issues, which made France import more electricity from neighboring countries(graph 13); similar events have occurred in 2012. As the french nuclear power plants enter their designed-decommissioning age, such thing should happen more and more frequently in the next ten years. For further information, please refer to: goo.gl/Cb2Qu3. As the share of renewables in electricity continues to rise, the wholesale prices of electricity in Germany gradually decreases. 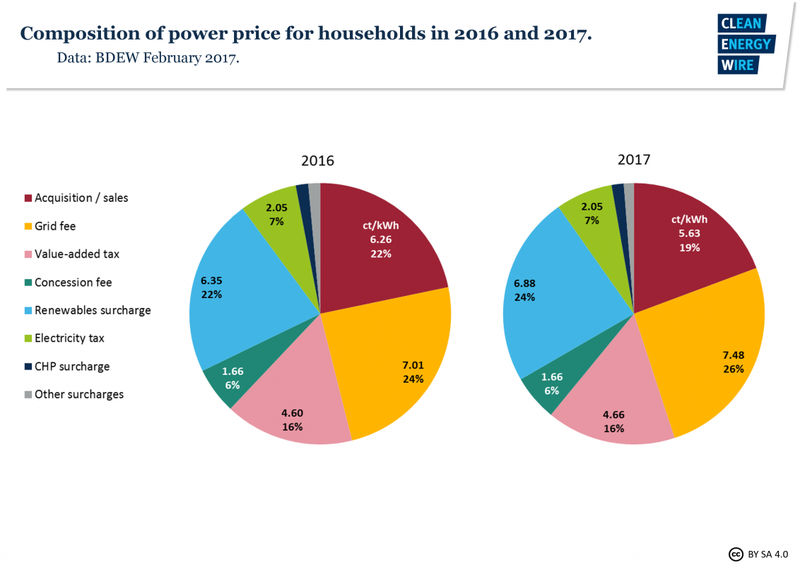 For an average household in Germany, the electricity bill is now mainly consists of a renewable surcharge due to the FIT system and a grid fee(graph 14). But the renewable surcharge due to FIT system is mainly given to the electricity suppliers who installed their renewables in the early stages of Energiewende(pre 2010), and therefore the surcharge is expected to fall after 2022(goo.gl/znkTsH); meanwhile, due to improvement of management skills, re-dispatch costs dropped in 2016(goo.gl/dXxqKq). Of course, the expansion of the grid will likely increase the grid fee in the near future, but in the long term such investment is necessary and can reduce the increment of dispatch cost in the future. Since 2013, power price of an average German household has remained relatively flat, therefore decommissioning half of the nuclear fleet is not the main reason why power price rocketed since 2000. And because of energy conservation and a strong economic growth, the quadrupled power price since 2000 does not increase the issue of energy poverty significantly in the German society. However we should still pay attention to the social inequality caused by regional power price differences, and whether the households who suffer the most impact receive sufficient support. 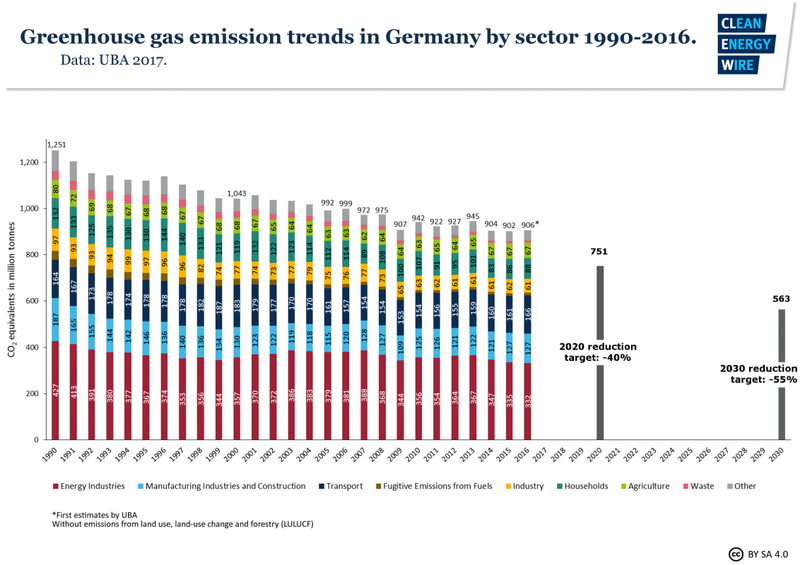 One thing can not be emphasized more: even with household power prices quadrupled within two decades, Energiewende is still highly supported by the majority of the German people. Of course the system is far from perfect; the industries don’t need to pay the renewable surcharge and enjoys abatements of grid fee, while there still exists no carbon tax nor minimum carbon pricing to represent the real costs of coal. This issues are discussed by the Greens and the Left during this election. As mentioned in section one and two, it is very likely that CDU and FDP form a coalition and cast adversaries to the progress of Energiewende. The reason for this is of course partly due to a more concern in the immigration issue and the rise of the right wing populism AfD(which not surprisingly, denies climate change and opposes the Energiewende). On the other hand, the rapid decline of coal industry has gradually intensified the conflict between the owners and workers of the industry. Owners of coal mining and coal power plants claim an image of protecting working rights when dealing with the pressure the society pose upon them, but when things become obvious that the end of the coal industry is near, the best way for the owners to maximize their profits before decommissioning is to avoid investment in more environmentally friendly and safer equipment. Meanwhile, for the unions and workers, what is of more importance is for the industry to set up a social-aid fund as soon as possible and expand it while profit still exists, which can then be used for job training or retirement aids in the future. The conflict in interest between the industry owners and the workers can be demonstrated no more clearly than when a “socially acceptable” coal phase-out time table was published by Verdi, one of the largest union in Germany, in last September. We look forward to seeing the intensification of the conflict between the owners and workers of Germany’s coal industry, just as we also look forward to seeing similar events take place in the US, and Trump’s myth of saving the economy with coal mining disillusioned. On this issue, the Left Party of Germany has the firmest stance among all established parties. A low carbon transition is not really about carbon reduction but more about social justice, so they claim this should be a “socio-ecological transition”. The issues this article has mentioned above, including rights of coal mining workers, restriction of renewables development due to auctions, inequality of electricity charging, the absence of a carbon tax, are all dealt by the Left Party with a set of policies which are in line with the interest of the common people(goo.gl/2c9rYN). On the other hand, the Greens, who started its presence in the arena of politics via environmental movements, is being marginalized during this election. Such marginalization is perhaps almost unavoidable after Energiewende turned from a slogan of a minor party into a nationwide policy target. The nuclear disaster in Fukushima made the Greens scores major results in the elections in 2012, but five years has past, and their calls regarding environmental issues are no longer center of the electoral debate. From late March to mid May, the Greens either lost all their seats or their position in a coalition government. However, the Bundestag election in September can still result in a coalition of SPD, the Left, and the Greens, and even the possibility of a Jamaica coalition consisting the CDU, FDP, and the Greens is not crossed out by both minor parties. We can see from the analysis above that the German Energiewende can not be discussed purely from the composition of electricity, and even if so, it can not be discussed purely from the trend that nuclear’s “base load” function is gradually being lost. 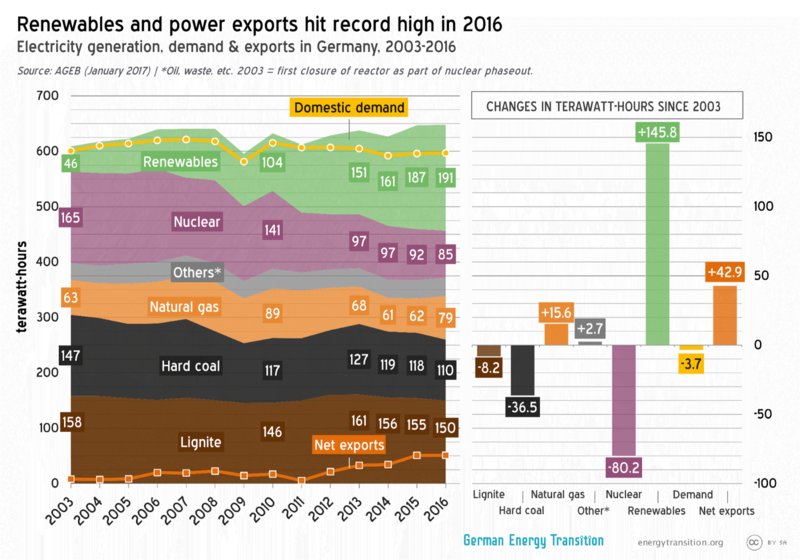 Although the period between 2016 and 2017 has witnessed substantial change of the energy policy in Germany, and probably will see more change after the election, but whether the low carbon transition with a nuclear phase out is correct is no longer a subject of debate for the main parties. Just like what the Chinese Communist Party love to say: this is a choice of the history, and also the choice of the people. A Taiwanese turtle who studies in the master program of Renewable Energy Engineering and Management in University of Freiburg. Covering renewable energy development and deployment around the world.